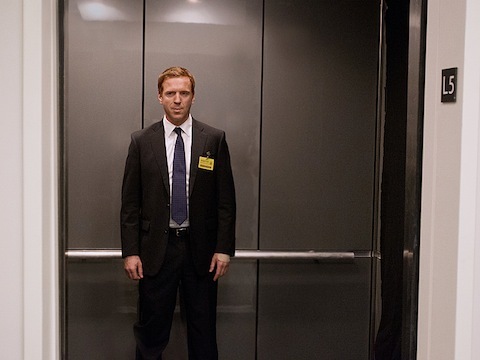 Last night's episode of Homeland felt almost like the season finale. But there is most definitely one episode left, and from the promo for "The Choice," it's a big one. Something is brewing on this show, but we'll have to wait until next Sunday night to see what that is. Spoilers if you're not caught up through last night's "In Memoriam"! Abu Nazir is dead. We saw him gunned down during last night's episode. So, it's over, right? Hardly. Nazir may be dead, but the promo for this Sunday night's season finale suggests that something big is in the works. The start of the promo indicates a sort of honeymoon phase for Carrie and Brody. Nazir is dead, Brody's marriage is over, maybe these two kids can finally have their storybook romance. I'm thinking, not likely, no matter how badly they want it to happen. And it looks like Saul may be the voice of reason in Carrie's life. Beyond Carrie and Brody's romance, there's a burial at sea coming up and an assassination attempt of some sort. By the way the video's edited, it seems like these two things are connected somehow. Or maybe it's simply that Nazir's final act of terrorism will be carried out from beyond his watery grave. Homeland airs Sunday at 10:00 p.m. ET on Showtime. Here's a teaser photo from the Season 2 finale, which - judging by the look on Brody's face - has me wondering what's really going on in his head? Am I being paranoid? Or does this happy ending between Brody and Carrie seem too mushy to be true? Can we trust that he's a changed man? Or is does he have something else planned?